The Wiener Bezirkszeitung Mariahilf (local district newspaper) has published a report on the research carried out by the ICEC project team and featuring Dr. Josef Kohlbacher of the Vienna research team. 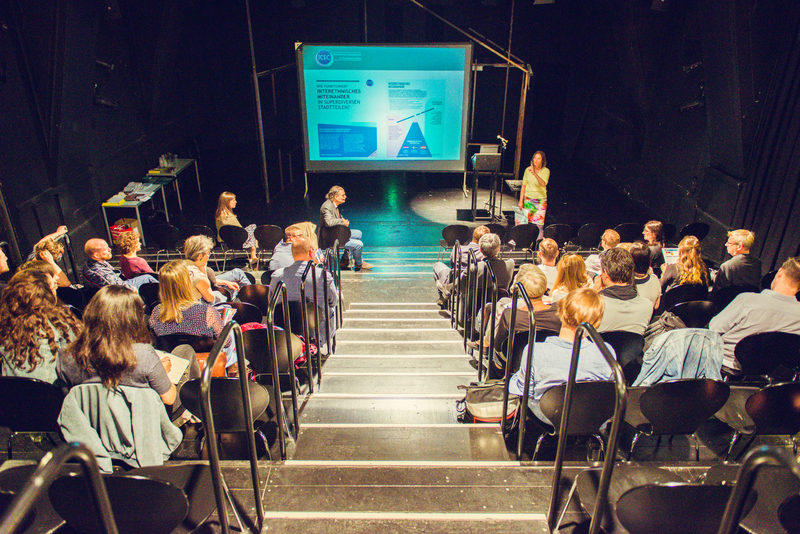 The project conclusion was held at a theatre in Gumpendorf, a part of Vienna’s 7th district and one of the case study areas for ICEC’s three-year research project. For a full report on the event and downloadable research results in different languages click here. Download the full article (in German) or visit meinbezirk.at to read it online. Last Wednesday, the ICEC team finalised the long journey of the 3-year research project with a final conference in Vienna. In the creative space of the TAG Theater an der Gumpendorfer Straße, Julia Dahlvik, Yvonne Franz and Josef Kohlbacher (all ISR) presented their research results and the ICEC poster to project partners, collaborators and interested members of the public (download here). The results were discussed with Nathalie Binder (initiative Matznergarten), Florian Brand (Urban Renewal Office 7/8/16) and Markus Rumelhart (district mayor in Mariahilf, 1060 Vienna) followed by neighbourhood walks through the district. Markus Steinbichler (Urban Renewal Office 6/14/15) highlighted spaces from the “Miteinander in Mariahilf” neighbourhood project, Julia Dahlvik discussed the role of the public space as space of encounter, Yvonne Franz explained the concept of urban living labs and Josef Kohlbacher showed the relevance of a diverse street for the neighbourhood with changes along Gumpendorfer Straße. The common sense for interethnic coexistence in superdiverse neighbourhoods in Amsterdam, Vienna and Stockholm can be found in a small detail that may comes unexpectedly: Small, superficial contact with others in the neighbourhood is of crucial relevance to create attachment and potentially co-responsibility in the long term. Click the thumbnails of the poster to download our results at a glance in the ICEC Poster in German and English. And if you want to get a glimpse of the atmosphere during the final presentation, have a look at our photo album. Breitensee, an area in Vienna’s Penzing (14th) district, now has its first community garden, established under the motto “Growing Together!” and with the aim of growing both plants and community relationships. ICEC partner GB* is working together with the organisation “Gemeinschaftsgarten Matznergarten” to create a new urban space of encounter, with the first season concentrating on getting to know the neighbourhood and fostering relationships with the local population. The Matznergarten community garden will be one of the Vienna ICEC team‘s Urban Living Labs, and an example of a bottom-up initiated space of encounter. It follows an ongoing trend in Vienna which has seen several such community gardens established in recent years. To read more about the project or to get involved, please visits the links posted below. On 30th April, the ICEC Vienna team participated in the kickoff event of the neighbourhood project “Hallo NachbarIn” (Hello Neighbour), a project which aims to increase the participation of residents in the Mariahilf district of Vienna in local events. Each Thursday, the “idea market” is open for suggestions from the local population about how a nicer neighbourhood and cohesion amongst neighbours might be best achieved. In cooperation with the Urban Renewal Office 6/14/15, the ICEC Vienna team will be present at the weekly market at Kurt-Pint-Platz ( 1060, Vienna) to engage with local residents. We are looking forward to gaining an insight into neighbourhood belonging and interethnic coexistence. See you at the market! Earlier this week the city project teams met in Amsterdam, giving us the opportunity to visit another of the case study areas. This time it was Van der Pekbuurt . For more information about the area and why it was chosen to be a ICEC case study area, please visit the district profile page. The ICEC Baseline Studies lay the foundation for an analysis on how can cities promote interethnic coexistence in the local context and which political measures are the most adequate for strengthening the integrative power of an urban neighbourhood as a place of living and identification of a diverse urban population. Albeit largely descriptive, they aim to provide a detailed account of each city´s diverse population in the context of immigration and how the city´s administration and political actors have developed urban policies dealing with diversity. These ICEC reports present basic yet relevant information that will be needed for answering ICEC´s main research questions. The reports can be downloaded from our publications page. In June 2014, our project partners from the Urban Renewal Office opened their new community center in one of our study areas – Hippviertel in Ottakring. The “Herbststrasse” will also serve as a place of encounter within our “urban living lab“. Below are some impressions from their opening event. You´ll find more information on their ongoing activities here (in german).